Edition 05 : 09 November, 2014. 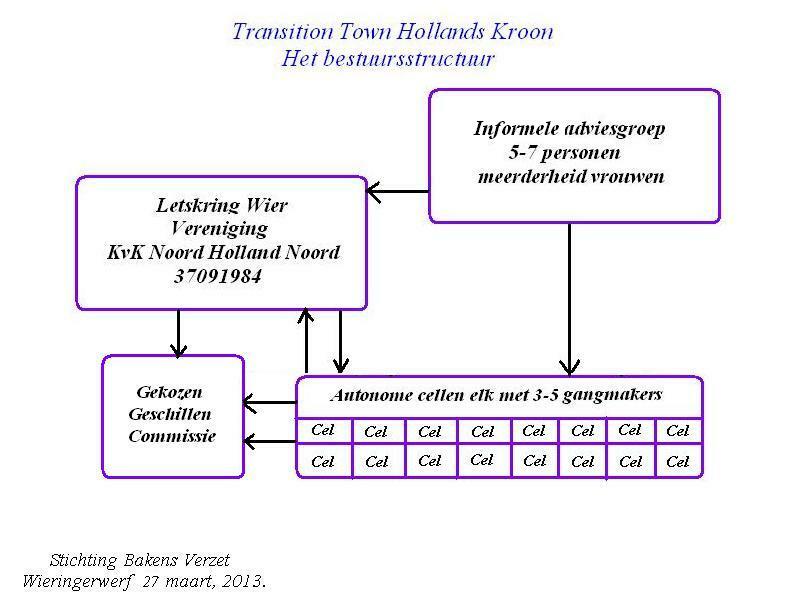 PROPOSAL FOR THE TRANSITION TOWN HOLLANDS KROON. Powerpoint Presentation of the Plan for the Transition Town in Hollands Kroon, Wieringermeer, Netherlands. Illustration of a Transition Town centre : Example : the Wieringermeer (part of the Hollands Kroon council area) . Transition Town, Wieringermeer, management structure. Local exchange system : vertical structures. Local exchange system : responsibilities and the division of tasks. Complete information on LETS Kring Wier (in Dutch). 01. Where do we want to go? 02. What is a transition town ? 03. What do we need? 04. Which types of cell do we use? 05. How do we do it? 06. Interest- and cost-free micro-credits. 07. Relationships with the Town Council and formal institutions. 08. What risks are there ? 10. The local exchange system (Letskring Wier). 11. Some advantages for members. 01. WHERE DO WE WANT TO GO ? - on the basis of their voluntary non-competitive cooperation with other LETS groups and transition towns. ( Transaction balances between groups always tend to zero). Localisation involves the local production of as many goods and services as possible, and their consumption as close as possible to their place of production. Small-scale activities are essential for a healthy community where producers and consumers of goods and services know each other and are in a position to coordinate their use well. The following notes have been taken from website www.transitiontown.nl and translated. An English version of the website is also available. “A Transition Town is a popular citizens’ initiative in towns, villages or local areas to make their life-style, work and environment less dependent on fossil fuels and to improve social contacts there. Peak oil and climate change with their connected economic crises are the main reasons for taking action. “Transition Towns seek to create waves of small-scale, social and payable solutions to promote a switch to a fully sustainable world. Independent popular citizens’ action can break through political and economic barriers. They give people a chance to contribute and take part in the change towards a better, healthier and happier World. “Transition Towns promote a cultural change in which people, biodiversity and flexibility are central. So that we can organise a strong, healthy, and peaceful reaction in the presence of energy, climate and economic crises. We strive for the timely achievement of a practical, attractive world with less energy, fewer goods and less money. 03. WHAT DO WE NEED ? Spirit – motivation to give form to initiatives. Contact – with neighbours, and local organisations and authorities. Empathy – leaders who understand the local people and follow up their initiatives properly. Establishment – in the community, accepted by the town council; cooperation with local businesses; involvement of young people, especially women, authorities that are willing to cooperate. Equipment - means, time, capabilities. Cell type 1 : Neighbourhoods and centres. Cell type 2 : Clubs, school classes, and charitable organisations. Cell type 3 : Schools. Cell type 4 : Businesses. Cell type 5 : Local councils and authorities. Each neighbourhood has a small, youthful, energetic steering group, preferably with a majority of women. All types of cells cooperate with each other. Neighbourhoods with neighbourhoods. Centres with neighbourhoods. Centres with centres. 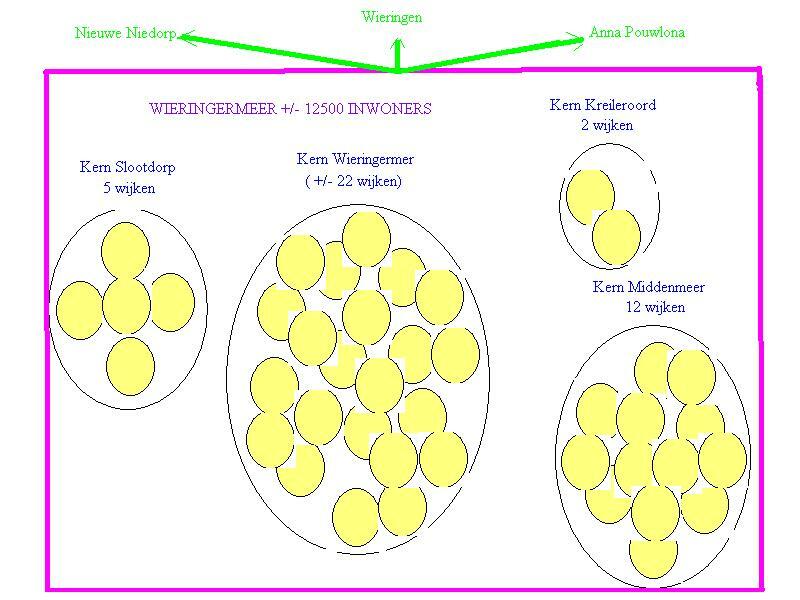 Illustration of a Transition Town nucleus : Example for the Wieringermeer. We do not need to profit from our “capital.” We can share out things with others, both inside and outside the LETS system described in section 10 below..
Gratis recycling in groups living in a given street, eventually with periodical “really really free” markets. Pass-on and exchange groups for equipment, art works, clothes and similar. A list of typical activities for cell 1 type structures. They include gifts of time (local exchange units) allowing family members friends and groups to subsidise the elderly, the handicapped and the ill who consume goods and services but are unable to earn (enough) local exchange points to pay for them. That way the needy are provided with a multi-tiered social support system. Each accepting club, class or charitable organisation (and with them all their members) can participate fully in the local exchange system set up, so that the cost of services provided for the group can be distributed amongst its members. Members , clubs and organisations are all in turn free to make use of the local exchange system in the normal way. Cell-type 2 organisations do not receive an initial local LETS quota of 500 units. This is because they themselves do not actually produce anything. Services are provided by their members, all of whom are individually awarded (once only) the initial quota of 500 units when they join the system. Costs expressed in the local exchange unit run up by clubs, classes or charitable institutions can be divided amongst their members who can perform return service within the local exchange system as a whole. School classes are considered as cell type 2 clubs. Buildings – maintenance (where necessary with permission and contribution of the town council). Preparation training sessions and matches. Shower and dressing areas, cleaning. Any other activities needed ! There is one group for each school, eventually one for each class. In that case all parents would become participants in the local LETS system. The transaction costs of the school (or class) are divided amongst the parents. Individual parents can earn credits within the local LETS system in the normal way. Individual school classes are normally considered and classified as clubs. Cell-type 3 organisations do not receive an initial local LETS quota of 500 units. This is because they themselves do not actually produce anything. Services are provided by parents, all of whom are individually awarded (once only) the initial quota of 500 units when they join the system. Businesses can also participate as such in the local LETS system. In that case all members of management and staff would become participants in the local LETS system. For participating businesses, agreements need to be made with the tax department because, under the present financial system, professional activities are subject to taxation however they are carried out. Businesses do not receive an initial local LETS quota of 500 units. This is because they themselves do not actually produce anything. Services and labour are supplied by management and staff, all of whom are individually awarded (once only) the initial quota of 500 units when they join the system. Group activities amongst employees are organised as cell-type 2 initiatives, the same way as clubs. Cell type 5 : Town council and local authorities. Town councils (eventually their individual departments) and organisations such as water boards can join the local LETS system. 05. HOW DO WE DO IT ? 01. Systems are gradually built up beginning with a couple of quarters and/or a couple of clubs for just a few activities in one district centre. 02. Cells can be quarters, clubs, businesses, schools etc..
03. Start the local exchange system up. Children can participate from the age of 13, provided they have their parents’ permission. 04. Find a few (3-5) young(er) leaders ( if possible with a majority of women) to lead integrated activities in each quarter ( +/- 100 homes, 250 people) or other cell-type that all residents, members of the local exchange system, can participate in. Participation is never compulsory, but should be made as attractive as possible. No-one is “forced” to make use of the structure. 05. Seek the cooperation of the local council. Examples might be an exemption from the costs of green rubbish collection; making some public places available; a water source; eventually one or more activity facilities. 06. A typical system population is 50.000 or 200 residential quarters. All groups are interactive, which means that can all carry out transactions with each other. 07. Seek agreements with sports and other to solve their problems in finding volunteers for their activities. There may easily be +/- 200 sports clubs in each system with 50.000 people, plus numerous other associations and NGOs. Their members can all be independently grouped, “volunteer” work paid in local exchange units and the related debits distributed amongst all of their members. 08. Residents in each of the residential centres can similarly grouped and the local unit cost of transactions and initiatives split up and shared in any kind of combination. 09. All transactions re administered under the local exchange system created. 10. Local residential centres, residential quarters, clubs, businesses etc, are all independent cells within the local exchange system. 11. The independent cells can cooperate in all sorts of combinations. 12. Members of an organisation living in specific local centres can also be grouped independently. 13. Social support is built into every cell, local centre etc. 14. Start slowly, beginning with a couple of residential quarters and/or clubs. 15. Third party insurance policy is needed. Where possible extend existing local council policies to cover all operations under the Transition Town plan. 16. In case of excess production in relation to local needs, reach agreements with food banks and other local exchange systems. 17. Active leaders automatically qualify as organisers for activities in new cells and systems. (Concept of elf-education). 06. INTEREST-FREE, COST-FREE MICRO-CREDITS FOR PRODUCTIVITY PURPOSES. The micro-credit systems in quarters, local centres, main centres, and/or at general system level can be set up. Example : quarter with 200 adult members. Euro 5 per person per month. The amount available the first month is Euro 1000. This amount increases every month. The system includes a system for guaranteeing full repayment of loans. The repayment period is in principle decided by the borrowers. Administration costs are settled under the local exchange system. Cooperative group purchasing clubs can be started up. One example is to cover energy requirements locally. The formal money (Euros) invested remain in circulation inside the system. Financial leakage out of the Transition Town system is restricted, and if possible blocked altogether. 07. RELATIONS WITH THE LOCAL COUNCIL AND AS APPLICABLE WITH OTHER AUTHORITIES. The town council should itself become a member of the local exchange system. Groups and individuals can carry out work for the council against payment in local currency units. The local council can obtain its credits in local exchange units by allowing some of its services to be paid in local exchange units. Otherwise, the local unit costs can be split up amongst all members of the system or amongst the members of quarters, clubs etc. Examples : collection of stray rubbish; management of local animal gardens; help with maintenance of parks and gardens; management of unused areas. 08. WHAT ARE THE RISKS INVOLVED? Lack of clarity in the tasks passed on to participants. Failure to delegate responsibility to participants. Deliberate or unintentional exclusion of particular groups and interests. Insufficient support from members; insufficient demand for support by the leaders. Insufficient time dedicated to evaluation. Too many meetings, too little action. Lack of pleasure during meetings. Activities should always be "fun". Transition Town, typical management structure. 10. THE LOCAL EXCHANGE LETS SYSTEM. A Powerpoint presentation is available. See : Short illustrated course on the planned local exchange system. Participation includes in principle all system residents 13 years and older. Residents do not need to use the system. Participation starting at 13th birthday, children under 18 with the permission of their parents. Transactions can take place between individuals, individuals and cells, local centres, council and authorities , and all of these amongst each other. Transactions between local exchange systems and other Transition Towns possible. Individual members start with 500 units, or 50 hours against an average charge of 10 units an hour. The number of local exchange units in circulation in each system is therefore constant. It changes only with increases (or decreases) in the number of residents (members). Members who are not persons receive no local units on start-up, as they do not themselves perform any work. Their credits and debits are shared amongst their members. Distribution of credits and debits is principle made on a monthly basis according to an annual plan provided by the non-personal members. The administrators of the local exchange system are always free at their discretion to distribute credits and debits more or less frequently than one month. Short illustrated course on the planned local exchange system. Use of the services of other members. Enjoy the use of all sorts of services without the need for formal money (Euros). Buy fruit vegetables diary and meat within the local exchange system, with a saving of up to € 20 per family per week (€ 1000 per year). Use of cooperative purchasing groups. Improve the quality of life especially of people with a minimum income, the ill and the handicapped. Make use of unused spaces, in some cases against rental payments expressed in local exchange units. With the agreement of the council, use public spaces for productive and social purposes, in some cases against rental payments expressed in local exchange units. Availability of cooperative interest-free, cost-free loans for productivity purposes. Availability of social security nets for members. A small price in local exchange units is paid for urine collected. Volunteers are well paid for their work. Unemployed can use their time usefully and improve their quality of life. 12. WHAT ARE THE COSTS ? Formal money requirements for start-up and management are minimal. A simple database programme can be run offline. The same applies to the cooperative micro-credit system. Second-hand computers can be used, or members’ computers hired for local exchange units. Één online computer voor het beheer van contacten met leden en derden. An internet subscription with website access. To start with a member’s website could be used. Office articles : one or more guillotines for paper, one or more strong staples, one or more printers fro transaction slips. Paper for transaction slips and documents. Staples for transaction slips books. Travelling costs (fuel). These are minimal and most activities are local for which bicycles can be used.